The Project: Create a bronze relief to commemorate where British prisoners from the schooner Gaspee were taken ashore. The burning of the Gaspee is considered by Rhode Islanders to be the first act of armed insurrection of the American revolution. The Solution: I designed a plaque that had a combination of image and text. The foreground figures are in very high relief and the height of the relief diminishes with the more distant images of the boats and water. I tried to include details like the militia man tending his horse to add character and believability to the scene. Recollections: The fact that the plaque would be so meaningful to the community of Warwick, which annually celebrates Gaspee Day with a parade and battle reenactments, made this a very exciting opportunity. The success of the Gaspee Plaque made me the plaque guy for Warwick. The city asked me to make a plaque for a recently deceased member of the city council. I tried to distinguish the plaque from the ordinary by giving it an interesting almost art deco shape and creating a decorative oak leaf motif. The city of Warwick asked me to make a plaque commemorating a recently deceased citizen who was a hero to his community. Jerry owned a small market and extended store credit to people in the community. Many poor people from the neighborhood had access to food and essentials through Jerry’s generous credit, which was often repaid in favors and good will if not in money. I found this story very moving and felt much of it had to be told in words. Angela spent an enormous amount of time sculpting the letters on this plaque. We like to maintain the quirkiness of handwriting in our sculpted letters. The first years of JMW Arts High School, where I teach art, were tumultuous. 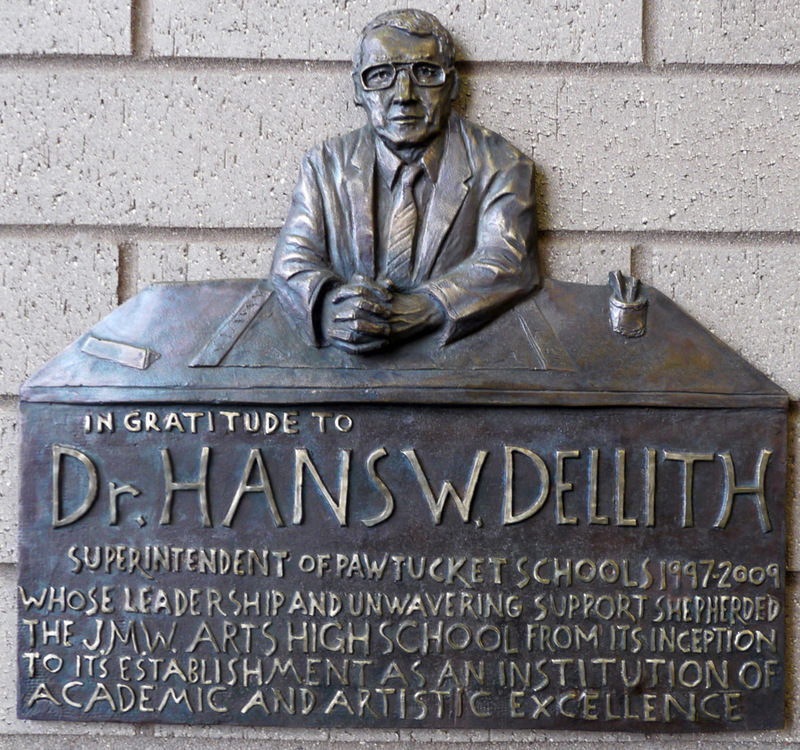 Had it not been for the steadfast support of superintendent Dr. Hans Dellith, the school may have been closed. When he retired in 2010, I was asked to make a plaque in his honor. I made the plaque depict Dr. Dellith sitting at his desk and modeled the inscription on the front of the desk, facing the viewer. In 2005, The Jaqueline M. Walsh School for the Performing and Visual Arts (JMW) opened. I am the visual art teacher at JMW, Rhode Islandʼs only public audition-to enter arts high school. The school is named after a beloved administrator, who was a strong advocate for arts education, who had lost her battle with breast cancer a few years earlier. 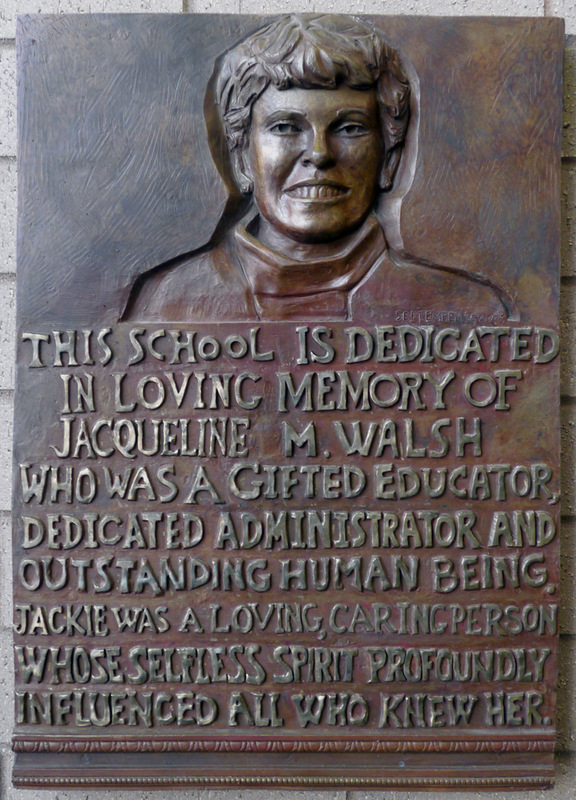 I was asked to create a bronze plaque in her memory for the school. I made this job part of my first assignment with the students. I used this as an opportunity to teach the abstract principles of design as applied to letters and letter spacing. The committee provided a long inscription, so I gave each student in the schools first class of art majors, a part of the inscription to model on a piece of wood. I made molds of each students work and combined them on the plaque. This makes the inscription very lively as the handwriting changes. I am sure that involving the students would have pleased the honoree.